Assume a position of balance (generally with legs shoulder with or less apart, but wider than feet together). If any substantial amount of weight is being used, it is recommended that the barbell is placed on a stand. Grip the barbell slightly wider than shoulder-width with the desired grip (overhand or alternate), stand up so that the weight is off the stand, and ensure that the core is kept tight throughout movement, which, in turn, maintains the back in a straight position. This is optimal. Inhale. Shrug the shoulders both up and back (keeping the arms relatively relaxed so as to keep focus on the trapezius), hold the squeeze briefly, and exhale throughout the movement. Lower the weight in a controlled manner, inhaling throughout the movement. Repeat steps 4-5 for as many repetitions as are desired. 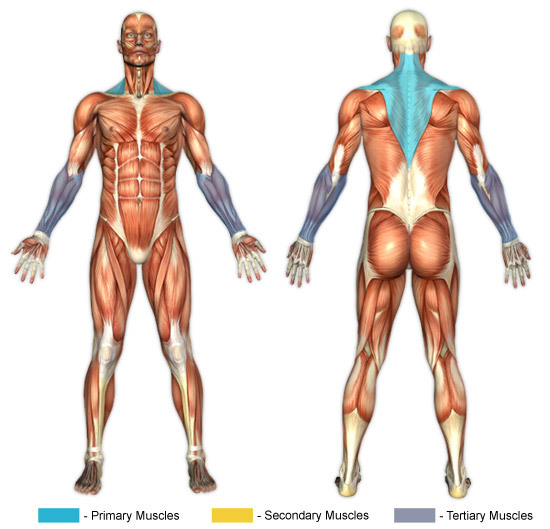 Barbell shrugs put primary focus on the upper portion of the upper back. When done with heavy weights in particular, maintaining one's grip can become quite difficult. There are several viable options that can be explored when faced with this problem. Wrist straps are a solution, but should generally only be considered a temporary one. This is because it is of course optimal to strengthen one's grip so that wrist straps are not needed. Forearm exercises are an excellent route. If you aren't using wrist straps (wrist straps are fabric straps that allow for heavier lifting by reducing stress put on the fingers and forearms) but still want to keep your grip when lifting a heavier weight, you can alternate your grip (using an, aptly titled, "alternate grip" or "reverse power grip") so that one hand is overhand (palm facing you) and one is underhand (palm facing away). This grip method can also be used in conjunction with wrist straps to further increase the amount of weight that can be held. It's effective for primarily two reasons: one is that it keeps the bar from rolling and the other is that it aids the thumbs in keeping their grip better. The latter reason is explained by the fact that with both hands in an overhand grip there are 8 fingers on one side of the bar and only the 2 thumbs remaining on the other. Whereas, with one hand in an overhand grip and the other in an underhand grip there are 5 fingers on each side of the bar. Thus, the thumbs have help. Switch the hand position every set to maintain muscular balance. Further, there are specially designed grip strengtheners that can work wonders, provided the necessary time and effort is put in. Captains of Crush grippers, made by a company called Iron Mind, make premium grippers which are specially crafted for people who are serious about strengthening their grip. There are several grippers available, each with different pound difficulties depending on one's goals and grip strength.